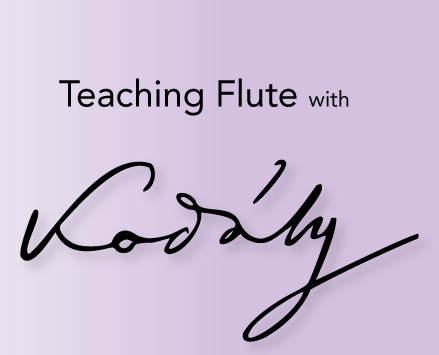 These “Teaching Flute with Kodály” articles are by no means meant to be a comprehensive source for teaching flute, rather a sprinkling of ideas that help enhance what you are already doing. During the day I teach general music in K-5 Public schools, and in the afternoon I teach private flute lessons. I’ve found my general music teaching has enhanced my private instruction in ways I cannot have imagined! This series deconstructs some adaptations of the Kodály method I’ve made for private lesson teaching. Zoltán Kodály (1882-1967) was a composer and music pedagogue who believed that all children should be exposed to high quality music. He called on music educators to refine their musical skills to their highest ability so they could properly teach their students. The Kodaly method is one of the most popular general music methods in elementary schools throughout the United States. As I understand it, the method focuses on developing a child’s voice first. Many of us are familiar with the Curwen hand symbols that have emerged from the Kodaly method. Along with Curwen hand symbols, Kodály teachers are typically very organized and sequence their musical skills meticulously, making sure not to identify a musical skill until the child has built the correct foundations first. Pedagogically speaking, a Kodály teacher is very careful in how they present skills; they understand the need for a new skill to be related to a skill already learned. Check out the article about teaching rhythm here. Meter is a tricky skill to teach at any age level. I find most my high school band students do not have an understanding of meter. I don’t teach meter to beginning students until they grasp rhythm, beat, and are able to sustain a phrase coherently. This short article details my thought process when teaching meter. My method is adapted from the Kodály method of teaching music. Meter (def. ): in music, rhythmic pattern constituted by the grouping of basic temporal units, called beats, into regular measures, or bars; in Western notation, each measure is set off from those adjoining it by bar lines. -Drawing hearts above every BEAT to indicate structure for rhythm. 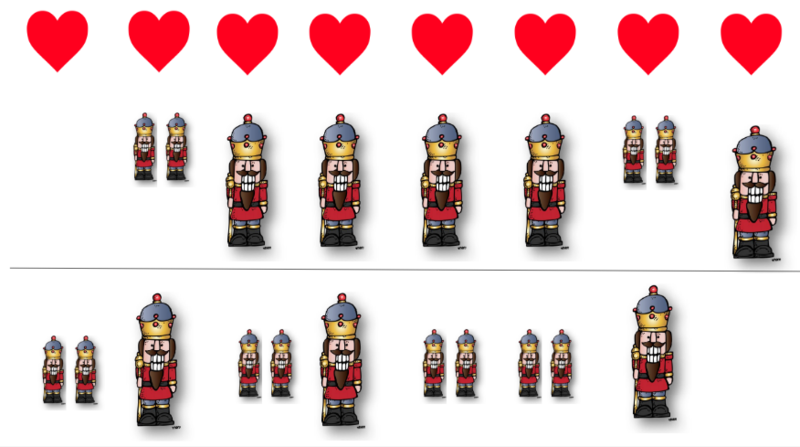 Iconic Pattern to the “Sugar Plum Fairy Waltz” Introducing BEAT. -Grouping strong and weak beats using bar lines that create MEASURES. I call the bar lines “walls” as if they are a structure in a house. One measure is a house. There is a difference between meter and time signature in my opinion. In my youth, I learned time signature was a means to determine how many beats were in the measure. We were taught the concepts of measure, time signature, and bar lines separately, and almost independently of each other. I understand why this is done, but I believe the best way to teach time signatures is by introducing the concept of meter first. This will support students’ concepts of phrasing while informing their breathing decisions. If you are starting a student from scratch, I believe there is a better way to introduce the ideas of time signature. I always introduce time signatures by emphasizing groupings of strong and weak beats within the barlines. Most repertoire for beginning students is in simple time, making it easy to introduce strong and weak beat patterns. The best way to learn strong beat patterns is to have the student sing, move, conduct or even draw the phrase, all while feeling a consistent, strong beat pattern. You should always demonstrate first. A great example is “Long, Long Ago,” a common beginner song. Play the song for the student, and sing through the lyrics while emphasizing movement towards the strongest beat. I love using subtle movement with big muscles while playing to feel strong beat/weak beat patterns. Once strong beats are located, ask the student if he or she notices how often the strong beats occur (every other beat). Have students perform this pattern using correct breathing, determined by the phrase length. To teach common time, present the concept of time signature by a combination of 1 strong/weak and another strong/weak beat combo to equal four beats total. Common time is the combination of SWSW (strong – weak – strong- weak), or strong beats 1 and 3. Simple and triple time can be taught in this way. The following example is of “My Bonnie Lies Over the Ocean” and can be transposed or taught by ear. Triple time is often compared to a waltz. I like to play a waltz while my student and I dance to the strong and weak beat patterns–it’s a fun way to introduce meter while having the student use their entire body to practice and play music. Simply introducing the concept of beat vs. rhythm might be helpful to their understanding of subdivision and playing complex rhythms. You can introduce strong and weak beat groups as means to understand phrasing. As an instructor, you might find the book Note Groupings helpful to your instruction of older students. Meter can extend beyond your student’s repertoire. Encourage your students to play their etudes, scales, and improvisations thinking of note groups and meter! How do you teach meter? Do you introduce time signature first? Please share in the comments.